Due to complicated structures and discontinuities in surrounding rock mass, existing empirical failure criteria cannot meet the requirements of engineering practice such as tunnels. To improve estimation accuracy on the strength of rock mass with joints, a modified chart of the Geological Strength Index using Hoek–Brown criteria was further tested to estimate rock mass strength [Lin et al. 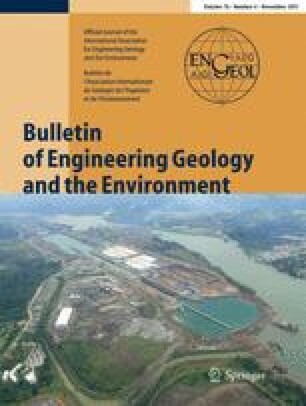 (2014) Bull Eng Geol Environ 4(73):1245–1258], and, in this paper, new strength estimation equations for jointed rock mass were then modified based on a large dataset obtained from Chinese projects. Here, standard drilling time is first introduced and described in this study, and then used as a parameter to estimate rock strength. Different empirical formulas based on joint density, rock mass classification, Hoek–Brown criteria, and elastic wave velocity are thus used to estimate rock mass strength by using data from the Jiubao tunnel. The results estimated based on different empirical formulas were similar, indicating that the modified assessment method presented in this paper can be used to estimate rock mass strength under certain circumstances. Cross-correlation of different empirical methods provides significant confidence in predicted rock mass strength calculations.